Donald Eugene Brown II was born April 11, 1987 in Red Bank and grew up in Atlantic Highlands. He starred in local youth sports programs before enrolling at Red Bank Catholic High School in Red Bank. As a senior for the Caseys, Donald ran for more than 2,000 yards and scored 27 touchdowns. Recruited as a running back, he boiled down his choices to Wisconsin and UConn, and picked UConn. Head coach Randy Edsall red-shirted Donald in 2005, and made him the Huskies’ main kickoff returner in 2006. He also served as a backup running back to team captain Terry Caulley. In a 52–7 opening day win over Rhode Island, Donald racked up 118 yards on just 9 carries. Later in the season, after Caulley was injured, Donald ran for 199 yards in his first start, against nationally ranked Rutgers. A week later, he topped that with 205 yards and three TDs in a double-overtime win over Pitt. The Huskies’ record stood at a respectable 4–5 at that point, but they lost their final three to finish 4–8. Donald racked up 896 yards and averaged over 130 per start to earn Second-Team All-Big East honors. Donald split running duties with Andre Dixon his sophomore year and finished with 821 rushing yards. The Huskies started the season 8–1, with victories over Top 20 schools Rutgers and South Florida. They only won one more game to finish 9–3, but earned a bid to the Meineke Car Care Bowl against Wake Forest. UConn went into halftime with a 10–0 lead but lost 24–10. Their only touchdown came on a punt return. Donald had a monster year in 2008. In his first eight games, he surpassed 100 yards and had more than 200 in two of them. In a 40–16 win over eventual Big East champ Cincinnati, Donald ran for 150 yards and broke Tory Taylor’s school record of 1,262 rushing yards in a season. In a 39–14 win over Syracuse, Donald broke Terry Caulley’s career record. UConn finished 7–5 and Donald was the NCAA rushing champion with 1,822 yards. He added 261 more in the International Bowl against Buffalo to become just the 14th player in Division I history to rush for 2,000 yards in a season. Donald was a no-brainer pick for conference Offensive Player of the Year. 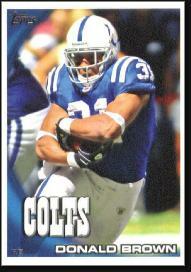 Donald opted to forego his senior season and enter the 2009 NFL Draft and became the first UConn player taken in the first round when the Indianapolis Colts selected him with the 27th overall pick. He played sparingly as a rookie, gaining 281 yards on 78 carries and catching 11 passes, but saw action in the Super Bowl, accounting for 29 yards on four carries and one reception. Donald notched his first 100-yard game in 2010 during a 34–24 win over Jacksonville. He ended the year with 497 yards, finishing ahead of injured Joseph Addai for the team lead. In 2011, without Peyton Manning, the Colts dropped to 2–14. Donald once again led the club with 645 yards. In 2012, with Andrew Luck at the helm, the Colts bounced back to go 11–5. Donald limped through much of the season and finished with just 417 yards on 108 carries. Donald was slated to share the Indianapolis backfield with newly acquired Ahmad Bradshaw in 2013, but both players were slowed by injuries. He finally won the starting job in the second half of the year, finishing with 537 yards and a career-high 27 catches for a total of 8 touchdowns. He gained 55 yards in Indy's first-round playoff defeat. In 2014, Donald signed a free agent deal with the San Diego Chargers. He shared the backfield with Ryan Mathews in a running attack designed primarily to protect QB Philip Rivers. In a win over the Bills, Donald notched a career-high 31 carries—13 more than his previous personal best.He finished the year with 223 rushing yards and a career-high 29 receptions. His role with the Chargers diminished in 2015 and the team released him during the season.